Will gives the group its next assignment in this episode still. It's courtesy of the installment "Never Been Kissed." Sam and Quinn talk about the group assignment in this shot. Many fans are rooting for them to get together. 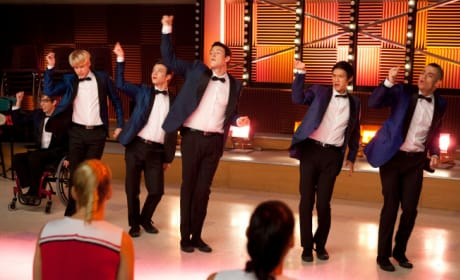 The men of New Directions do their thing in this photo from the episode "Never Been Kissed." 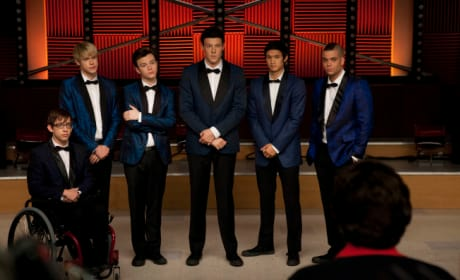 Nice to have Puck back, isn't it? Looking sharp, boys! The men perform for Coach Beiste in this scene from "Never Been Kissed." Mercedes steps to the mic in this photo from the episode "Never Been Kissed." Her and the gals are singing "Livin on a Prayer" here. 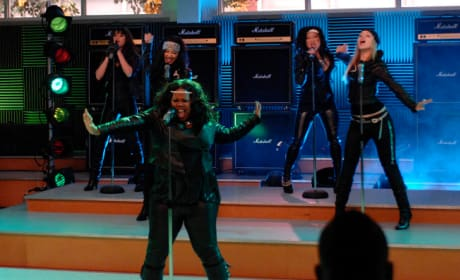 The girls do Bon Jovi in this picture. They recreate a classic single, "Living on a Prayer."